After George Lazenby flunked his big-budget audition for the role of James Bond, producers Broccoli and Saltzman gave the coveted job to Saint veteran Roger Moore. 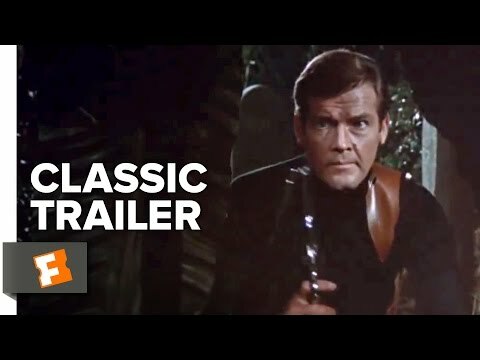 Moore is likeable enough, but his portrayal of Bond is markedly different from that of Sean Connery, who played Bond as a very dangerous man who had a taste for culture. Moore played him as a cultured aristocrat who could sometimes be dangerous (with the help of stunt men). Frankly, Moore isn't overly convincing in either aspect of Bond's two-sided character. Live and Let Die, as a film, is flawed in much the same way; neither the action nor the exposition are very convincing. The film attempts a few things that really do not fit in with the secret agent genre; Clifton James' redneck sheriff (J. W. Pepper) seems totally out of place — and yet he appears again in the next Bond film. And the villain of the story is a black drug lord, a character-type done much better on weekly TV cop shows. But Live and Let Di does possess a totally Bond-quality speed-boat chase through a Louisiana canal system, complete with high-flying jumps. And Jane Seymour is fetching as the Bonb-girl clairvoyant reader of Tarot cards. David Hedison (The Fly and the TV version of Voyage to the Bottom of the Sea) plays CIA agent Felix Leiter in the character's third appearance in a bond film. Hedison played Leiter again in License to Kill. Directed by Guy Hamilton, who also did Goldfinger and Diamonds are Forever, two of the better Bond films. Even Roger Moore's first outing as 007 looks embarrassingly weak compared to the efforts of Sean Connery and Pierce Brosnan. Roger was the wrong choice for this role, and he got worse as he got visibly older! The site I found that shot at, dustindye.net, was a little less harsh about Roger Moore's debut as Bond. "Despite the silliness of Live and Let Die, the movie was a step in the right direction after the cheese fest that was Diamonds Are Forever, Sean Connery's last outing. There is plenty to like about this film, not the least of which is the boat chase (even though the sequence goes on too long after it has run out of steam). The theme by Paul McCartney and Wings is the best in the series... Jane Seymour is stunning in her first major role. Now I know why my grandpa was in love with her!" And "Moore was 46 in this first of his Bond films — five years older than Connery when he bowed out. Nevertheless, Moore's take on the character was fresh and amusing. He didn't have Connery's screen-presence, but he breathed new life into the series and helped audiences accept that someone other than Sean Connery could play the role." The only part of this movie which still impresses me is the boat chase and the "jumps" it features. 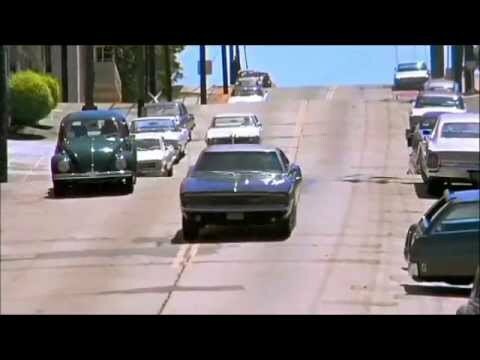 It was a new twist on the car chases we love, starting with Bullitt (1968) that featured a Dodge Charger and a Ford Mustang leaping over the San Francisco intersections in that exciting movie! Even Roger Moore's first outing as 007 looks embarrassingly weak compared to the efforts of Sean Connery and Pierce Brosnan. I love the way he whips that sidearm out of his shoulder holster at 1:11 in the trailer. They had considered Roger Moore before Sean Connery, but there were two problems. First Roger Moore was starring in "The Saint" TV series. Second, which was the killer, even thought he was three years older than Sean Connery, the Producers though that he looked too young for the roll. When he was picked for the role, the producers decided to move the Bond series in a different direction. This was an attempt to avert comparison between the two Bonds. It was a dismal failure, there was plenty of comparison. If you doubt that Roger Moore couldn't have played a hard edged Bond, then watch "The Wild Geese", "Ffolkes", or even "For Your Eyes Only". My complaint is that Roger is neither "hard-edged" nor amusingly tongue-in-cheek, the way James Coburn is in the two Flint movies. Sean Connery was often amusing when he delivered his signature quips because they were delivered as if he was doing it to amuse himself. However, when Roger Moore made a quip he looked like he was about to glance at the audience and wink. I guess it seemed that way because so many of them are delivered to no one in particular. They were just delivered to the audience. On the other hand, Pierce Brosnan's quips were written to sound as if Bond made a legitimate observation and then phrased it a clever way. Ironically he made almost as many quips when he was angry as he did when he was joking around! And most of the time he was actually talking to someone directly — not just trying to amuse the audience. Here's some examples. Out of the whole 8 minute video, only three quips were delivered "to the audience" rather than to another character. Yes, but this was the producers' choice, not Roger Moore's, although he was comfortable with it. The Producers may have been influenced by "The Saint", which was still popular in syndication at the time. Also Moore was known around the world as the Saint, and they may have been trying to piggyback on that. But the Producers did say that they were trying to distance Moore's Bond from Connery's Bond. It was during this period that Bond movies started being influenced, rather than being the source of influence. 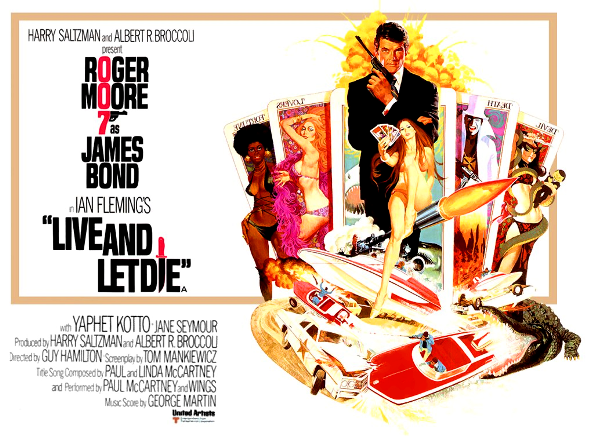 At the time "Live And Let Die" was made, the "Blacksploitation" films were popular, so Bond jumped on the bandwagon. The character of Jaws, that was played by Richard Kiel in two films, was a copy of his character in "Silver Streak", they just changed the color of his teeth. When Timothy Dalton took over, they decided to move the series back towards Connery's direction. I liked his Bond, and I don't know why he did so few Bond films. After Timothy Dalton, they decided to move in yet another direction with Pierce Brosnan. Brosnan was suppose to be Bond when Dalton got the role. "Remington Steele" had been canceled, and Brosnan was announced to be the next Bond, when NBC went SURPRISE! We decided to renew the show after all. YOU'RE SCREWED! With Brosnan, the Producers decided he should no longer be a womanizer, and be more sensitive and socially aware. That changed a bit by the end of Brosnan's run. But by Brosnan's final film, I was no longer interested, and did not see it at the theater. With Daniel Craig, the Producers went: SCREW IT! Jason Bourne is popular, so we'll just make Bond, Bourne. The last film "Spectre" was weird. It's like they tried to do an old fashion Bond movie, but no longer knew how. It had the elements of a 60s/70s Bond movie, but the elements were off, skewed, the rhythm was wrong. An excellent assessment. Absolutely nothing to debate about. Your explanation of the changing nature of the Bond films is very informative, and it explains a lot of things I've noticed but didn't know the reasons behind them. I suspect you're ripe and ready to watch that last Bond film, Die Another Day (2002), now that you're not expecting too much and can just enjoy what merits it may have. It's got some awesome science fiction elements, presented with very good FX. The action won't exactly bore you either. The opening scene (and even the title work) are surprisingly hard edged, but it gradually evolves into a more lighthearted and fun story. I've seen "Die Another Day", just not at the cinema. The same with the Craig Bond films, I've seen all but the second one on TV. I have to admit that I don't like Craig as Bond, although I did like "Spectre", I just found the pacing odd. I was looking forward to Loki as Bond, but then Craig decided he would do another one after all. LALD has the least memorable main theme score of all the Bond films. I agree with you Krel, Daniel Craig is okay as Bond not one of the best ever. When he retires from the part I won't consider it any great loss. But by Brosnan's final film, I was no longer interested, and did not see it at the theater. Oops, I misunderstood. I somehow thought you meant you hadn't seen it yet. My fault. Sorry about the enthusiastic-but-unnecessary recommendation. As for Craig as James Bond, his movies are great action films, but I don't really consider them "Bond" movies simply because they don't have the magic blend of action, humor, and that wacky Spy Craze absurdity which makes the Connery films so much fun, along with a few of the Moore films, and (in my opinion) all the Brosnan films. I had been thinking recently along similar lines in regard to the Tom Cruise Mission: Impossible movies. 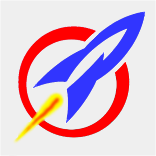 The original TV series IMF employed deception and gadgets to trick the bad guys into following a desired course of action. The TCM:I movies, on the other hand, still employ gadgets, but only to augment Tom's action scenes in pummeling the bad guys into submission. More gunfire, too. I remember enjoying the MI series back in the 1960s. However, as you've pointed out, Wayne, the fond memories of our childhood favorites tend fall flat when we try to capture the enthusiasm of our youth. At one point we tried to share episodes of the original Mission: Impossible, but we quickly agreed that it was surprisingly dull. Tim, unfortunately, was a staunch non-fan of Tom Cruise, despite my frequent request that we try some of his fine action movies. I have all the Cruise MI films (along with Knight and Day, Minority Report, etc. ), and I've pre-ordered the highly rated newest MI movie. In short, what you've praised about the old series just doesn't work for me anymore. But what you've criticized about the new movies is what thrills me to the core! The Cruise M:I movies aren't Mission: Impossible stories, BECAUSE of all the gunfire and explosions. In the TV series, if they did their job right, then the bad guys would never know they had been had. The TV IMF were subtle, like in "The Sting". The Cruise IMF is a sledge hammer firing off flares. The bad guys would have to be impossibly stupid not to know they had been had. That's why I quit watching the films after the second one. 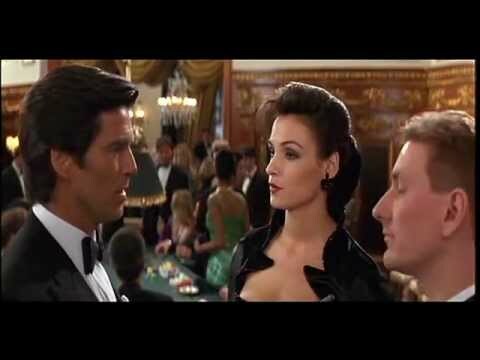 But please understand, I do not fault anyone for liking the Cruise M:I, or Craig Bond movies. Everyone likes something different.